This is a very attractive painting, by a European artist who seems to have studied the work of Matisse, the Scottish Colourists, and the Bloomsbury group. Whilst not replicating the style of any of these painters individually, nor producing a pastiche of any one artist, he or she has painted a still life which resonates with echoes of works by Duncan Grant, George Leslie Hunter, Roger Fry, Samuel Peploe, and Henri Matisse. 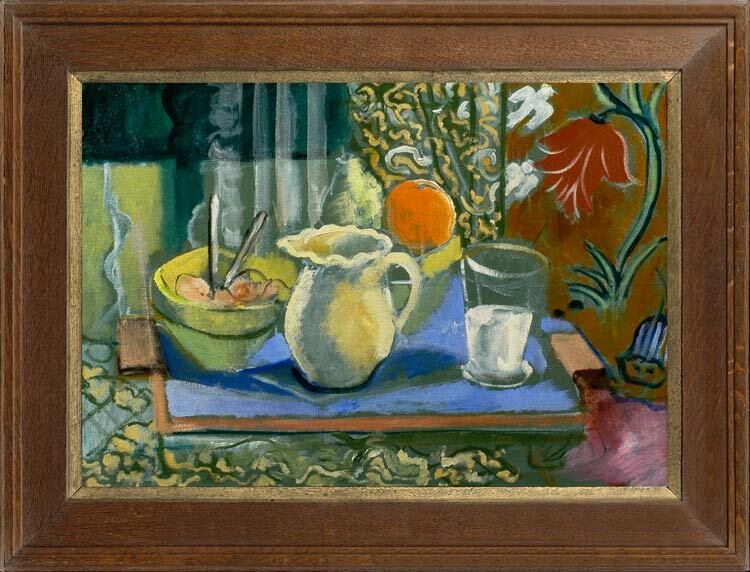 For example, Matisse’s Still life with apples on a pink tablecloth, 1924, National Gallery of Art, Washington, and Still life with geraniums, 1910, Pinakothek der Moderne, Munich, both use related pastel tones and patterned fabrics; whilst Hunter’s Still life: stocks, 1930, National Galleries of Scotland, reveals a similar technique in its brush-drawn outlines and texture created with a dry brush on the grain of the canvas. The smokey sage greens and blue outlines of the present painting are found in Peploe’s Tulips, Sotheby’s, 22/4/10, and in a more exaggerated form in his Still life with white jug, c1913, National Galleries of Scotland. Similar treatment and brushwork also appear in Duncan Grant’s Angelica playing the violin, 1934, Arts Council Collection. Our still life may well be by a British painter who has studied in Europe. Its symphony of greens, harmonizing with coral and terracotta, is particularly satisfying and tranquil.